Tandus Centiva custom area rugs from Tarkett offer choice, flexibility, and a quick turnaround time! Tandus Centiva’s refined woven area rugs add regality and luxury to any interior. Each area rug is constructed using the same advanced, high-quality methods Tandus Centiva products have been known for, meaning the new product offers excellent durability wherever it used. Tandus Centiva area rugs also are user-friendly, from the online customization and online ordering to placement within a designed space. Using an online configurator, customers can create and order the ideal area rug for their room in just a few steps. Within a few weeks, that rug is ready to be placed in the new space. Area rugs by Tandus Centiva allow an interior to be reconfigured time and again, enabling the space’s design to change at will. When trends or tastes change, these area rugs provide the classic touches unifying on-trend pieces. The new area rugs are available in 10 styles in 16 colors, with 21 colors for serging options. All serging colors are solution dyed, meaning they stand up to the rigors of commercial interior cleaning. The neutral colorways and subtle textures allow the rugs to merge with a décor without overpowering it, while the soft, square corners add sophistication to a finished design. The new Area Rug Configurator allows a designer to co-create by giving them the opportunity to build, visualize, and order an area rug. Tandus Centiva created the area rugs collection and based on products within the company’s collection, including designs from Suzanne Tick. Can you speak to the design features and technical innovations? Tandus Centiva area rugs crafted of solution dyed nylon and a blend of solution dyed and space-dyed nylons. Each rug can be ordered online, where customers can select the size, style, color, and serging color. Area rugs by Tandus Centiva add softness and deliver a “resimercial” element to an office space. These rugs can provide warmth to an area designed with hard surface flooring, or they can help define workspace areas within a larger space. Tandus Centiva area rugs are carefully designed for durability and ease of maintenance within a commercial environment. The area rug collection’s designs blend in with and unify changing design elements in an office space. Readers will appreciate the simplicity of the design and the ordering process. There are only five steps required to create a customized area rug. The 15-day lead time also is a fundamental element of the area rug product offering. The Tandus Centiva area rug collection launched in June 2017. 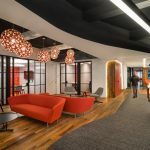 Many of today’s office spaces are designed in an open setting to allow for easy reconfiguration as business needs change. Although area rug design cues derive from residential design, Tandus Centiva area rugs are compatible with multiple design styles and use applications. The area rugs can easily be relocated as needs change – a rug that once defined a lobby can be used to anchor a new meeting space. Tandus Centiva area rugs are crafted with the same materials as Tandus Centiva’s other commercial flooring products. Can you tell a story or give an example of how this product has been used in a project? 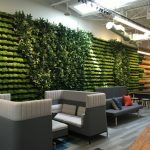 Several area rugs were recently specified for the corporate office of a multi-family housing company in a major Southern city. The rugs were installed throughout their space, in both office and public settings. They had a tight schedule, and our short lead time for fabrication and delivery quickly met their needs. They have reported that they are pleased with their new rugs. What is the expected cost of the product? Final price is dependent on the size and configuration of each rug. Ballpark pricing averages about $10 PSF, which includes cut-to-size premium pad, free standard shipping, and a five-year warranty. 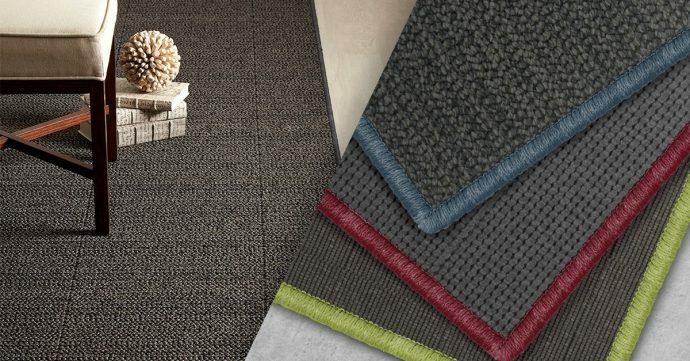 Tandus Centiva’s take on woven area rugs is anything but ordinary. The refined design adds a regal touch and luxurious element to any interior. Since they are created by Tandus Centiva, they are also manufactured with the performance features the brand is known for. Will you be exhibiting this new product line anytime soon? If so, where and when? Tarkett will be exhibiting at a variety of trade shows, including NeoCon. This post was sponsored by: Tarkett/Tandus Centiva. Great work Elise Shapiro. keep it up and keep inspiring us.